Over the past decade, Joe Sacco has increasingly turned to short-form comics journalism to report from conflict zones around the world. Collected here for the first time, Sacco's darkly funny, revealing reportage confirms his standing as one of the foremost war correspondents working today. Journalism takes readers from the smuggling tunnels of Gaza to war crimes trials in The Hague, from the lives of India's "untouchables" to the ordeal of Saharan refugees washed up on the shores of Malta. And in pieces never published before in the United States, Sacco confronts the misery and absurdity of the war in Iraq, including the darkest chapter in recent American history―the torture of detainees. 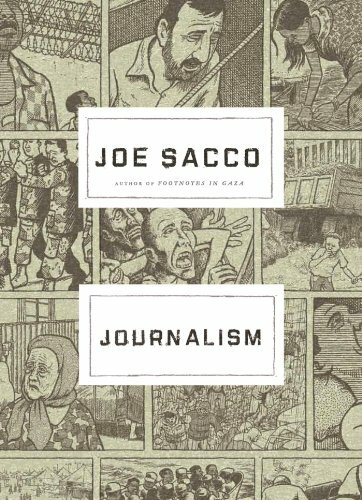 Vividly depicting Sacco's own interactions with the people he meets, the stories in this remarkable collection argue for the essential truth in comics reportage, an inevitably subjective journalistic endeavor. Among Sacco's most mature and accomplished work, Journalism demonstrates the power of our premier cartoonist to chronicle lived experience with a force that often eludes other media.